So, when you do not do well and feel that the market is not fair towards your value, what do you do? Delist. In the case of FGV, it is not that simple. It is a lot of small shareholders and some big shareholders losing money - including EPF (which is our money) I presume. I had an old article back in 2012 where I questioned the rationale of FGV being aggressive. At that point of time, I obviously did not know it is going to be so bad even. Expected EPF to even support its shares and it happened for a period. The party that caved in actually is not EPF but greed probably from a group of managers who think that they can go and conquer the world. They have not managed to and to the extent, could not even do well in its own backyard. Now KWAP is fearing of a delisting as if it is to be bought back at say RM3.00, they probably would lose substantial - which is probably what the article below is all about. To be fair to this new team of managers, they probably realise that doing M&As are not that easy. Good deals is when you wait (learn that from YTL) not when you charge towards your targets. The current situation for FGV is when it has to do a lot of revamping over the poor management in the past few years. I remember it even went to acquire a Cambridge GRAPHENE company. Who really know what graphene is? Even if it is, would FGV be in the position to execute well on the technology? See - to clear up mess is harder than to create them. What FGV should do is to go back to basics i.e. improving yield, market exposure, partnerships etc. etc. 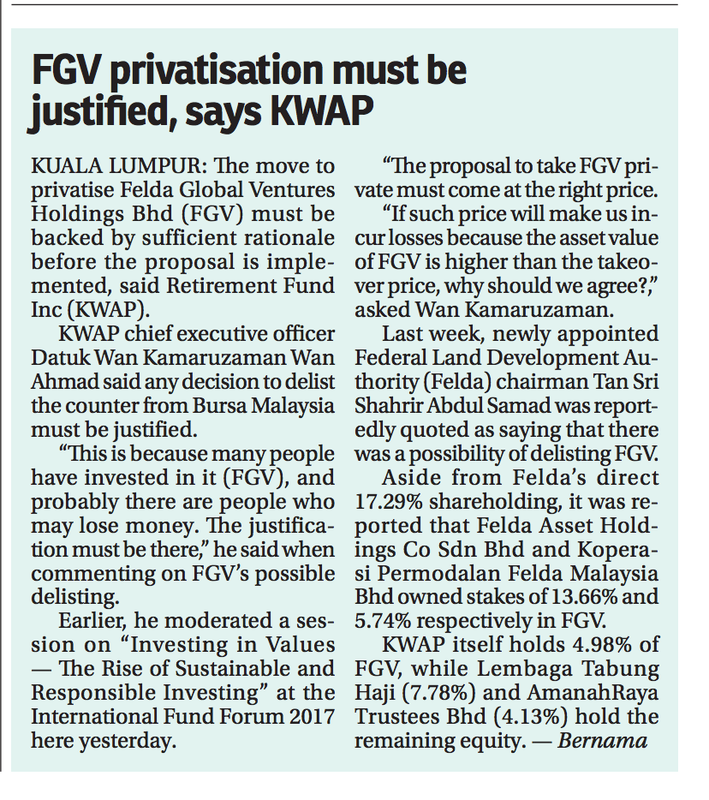 And the major seller (EPF) is also out now but REALLY, the most important thing for FGV is to get back to work - not being creative in exercises such as listing and delisting. Like most if not all GLC, national service is top of the agenda. EPF or other funds may be instructed to bailed out FGV. Else, EHP can do something since they already got a big premium from FELDA. Can just channel back some to FGV to lift the price up and sustain it until after GE14. FGV isnt a business but a political chess piece as well. For IHH it is with a serious business group mainly from Singapore. The others are “kan tou”. Big big difference. what can you expect from qouta managers? Well, for WCE don't know to think. I actually expect it to show good results from 2019 onwards. Intend to accumulate more if it is low.